Over two decades of consulting to medium and large organizations, David Frood discovered that the majority of the answers to even the biggest issues were known to employees. He later wrote “The Thinking Corporation” and “Steps to Becoming A Thinking Corporation” as a way of consolidating the research. These books have now been converted into a training program and associated software tools to help organizations promote employee participation. How do we make it easy for them to voice their opinions and follow-through on thoughts? Over two decades of consulting to medium and large organizations, David Frood discovered that the majority of the answers to even the biggest issues were known to employees. This started a long and detailed study of the reasons why people chose to remain silent, rather than tell their employer about ways to solve business issues, or simply make more money. 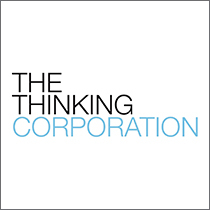 The study led to the generation of two books, “The Thinking Corporation” and “Steps to Becoming A Thinking Corporation” as a way of consolidating the research and solutions, to produce high-growth, innovative organizations. Increasing engagement – surveys report that on average 30% of employees are engaged in the business, 50% disengaged and 20% actively disengaged. This means that 70% the total cost of employment is unproductive. Reduce employee turnover – 40% of new hires leave within the first 18 months. The cost to the business varies from 50% of salary to hundreds of thousands of dollars, depending on the role. Sustainable innovation – Governments and businesses are crying out for more innovation to drive their economies. Converting some of the disengaged 70% can help achieve this goal. Intrapreneurship can be as simple as an employee identifying savings or better process, to big ideas for new products, services, markets or even businesses. Being pro-active in all three of the following initiatives will guarantee improved employee engagement and help promote intrapreneurship. If you have a minimum of 150 employees and interested in taking positive action to drive growth, efficiencies and profitability through increased engagement levels please contact: david@thethinkingcorporation.com or call 480.452.7577.